The BMW Platinum Protection Pack helps protect your investment when you buy a new or used BMW. 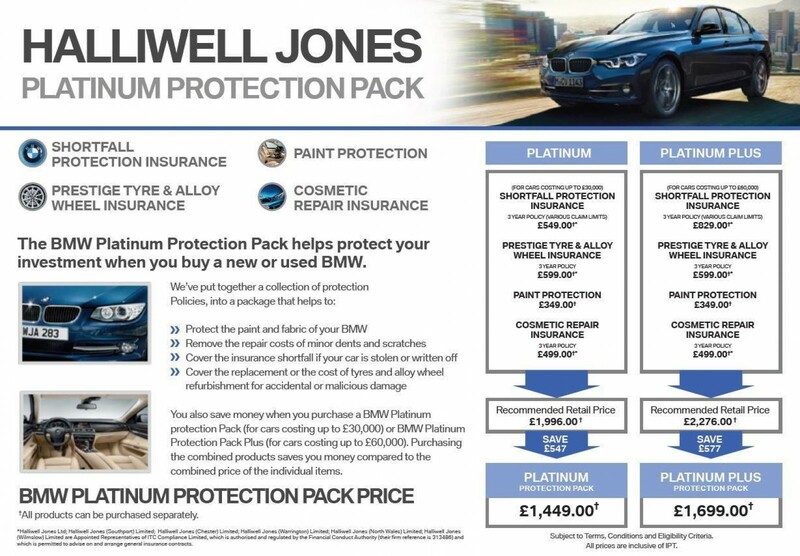 Why the BMW Platinum Protection Package? *Halliwell Jones Ltd; Halliwell Jones (Southport) Limited; Halliwell Jones (Chester) Limited; Halliwell Jones (Warrington) Limited; Halliwell Jones (North Wales) Limited; Halliwell Jones (Wilmslow) Limited are Appointed Representatives of ITC Compliance Limited, which is authorised and regulated by the Financial Conduct Authority (their firm reference is 313486) and which is permitted to advise on and arrange general insurance contracts.